With only 6 National Tour disc golf events in a season, I’m lucky enough to live in a state that hosts one of them. It isn’t just “an” event, it’s “the” event which concludes the tour itself. Looking back, the Vibram Open at Maple Hill has always offered up a challenge, even for the top pros. To put it in perspective, last year’s 2011 third place men’s open player, Paul McBeth, threw an even par 60 in his first round. We’re so used to seeing the pro’s put up scores in the double digit “under” category per round, and at the Maple Hill gold’s layout, you seldom see a round below -5 down. My personal introduction to Maple Hill only came a few short years ago. I realize there’s a deeper history beyond this, but the first time I really focused my attention on Leicester, MA was the year Barry Schultz absolutely destroyed the competition; 2009. “Destroyed” sounds like an overstatement, but his record setting first round 49 (if my memory serves me right) included an OB throw on a water hazard hole. He dominated from start to finish, and as fate would have it, that was one of his last great performances. Nikko Locastro finished 2nd to Schultz in 2009 and then came back to take 1st place in 2010. In 2011 Nate Doss won the Vibram, with Nikko again finishing 2nd. This would lead most people to assume Nikko is a favorite for the 2012 Vibram Open, but 2012 hasn’t been a dominant year for him. Conspiracy theorists might point to his shift to Innova, and claim that it’s been a difficult transition throwing a bunch of new molds. However, the more likely culprit is a back injury- which has been mentioned a handful of times on the Non Stop Disc Golf YouTube and Facebook accounts. He’s still registered this year, so is obviously a threat to win. The easiest way to guess at a winner is to look at the recent lead cards in big events, right? I’ve tried that in year’s past, but never seem to get it right. The hot hand of the moment is Ricky Wysocki. His game seems versatile enough to handle Maple Hill, and his putting is fearless. He also just won the Brent Hambrick Memorial Open with a ridiculous 1104 rated third round. I tend to pick players who are known for keeping a level head, and are used to the pressure. Maple Hill isn’t a course where you can cruise to an easy victory at the finish. Barry Schultz had poise in 2009. Nate Doss had poise in 2011. Even Nikko Locastro, who’s known for being super intense, is used to the spotlight and played great down the stretch in 2010. If I had to put money down on a winner, I’d actually bet on Paul McBeth. My gut is saying Wysocki, but McBeth is proven many times this year that he’s used to winning. The ability to remain calm and not make big mistakes down the stretch is going to favor the more polished player. Of course Will Schusterick is a threat to win, as is Cale Leiviska too. The Vibram Open is only three full rounds on a par 60 course. The importance of each putt and each stroke are magnified in comparison to other large tournaments which have 4+ rounds and a finals group. Who’s going to keep it together for three solid rounds this year? Switching gears to the women’s side, we see that Sarah Stanhope Cunningham has been a dominant force at Maple Hill, going 1st, 1st, and 2nd since 2009. Last year’s contest was won by Sarah Hokom (this year’s World Championship winner) over Stanhope by a single stroke. However, we don’t see Stanhope on this year’s list of Women’s Open division players. So naturally we look to Val Jenkins, who hasn’t won at Maple Hill since 2008, the year her brother Avery also won. She has only thrown under a 200 total score at Maple Hill once in the last four years. If Val is going to win this year, she’ll likely need to keep her score under 200. The sidearm throwing Hokom is favored on the tighter holes at Maple Hill but she’ll have to remain accurate all weekend. She’ll also need to keep her eyes open for newcomer Catrina Allen, as well as 2011 World’s winner Paige Pierce. If I had to put money down (and thankfully I don’t!) I would put it on Sarah Hokom. She has the recent World’s title to boost her confidence and the tight nature of the course on her side. Playing the devil’s advocate however, Val has a real challenge in front of her and she may just rise to the occasion. The only thing I know for sure is that I’ll be spending my weekend in Leicester, MA watching the best men’s and women’s players battle it out for victory at the Vibram Open. That, and the fact that I exist. A little cogito action for ya’ll. Cogito ergo sum. 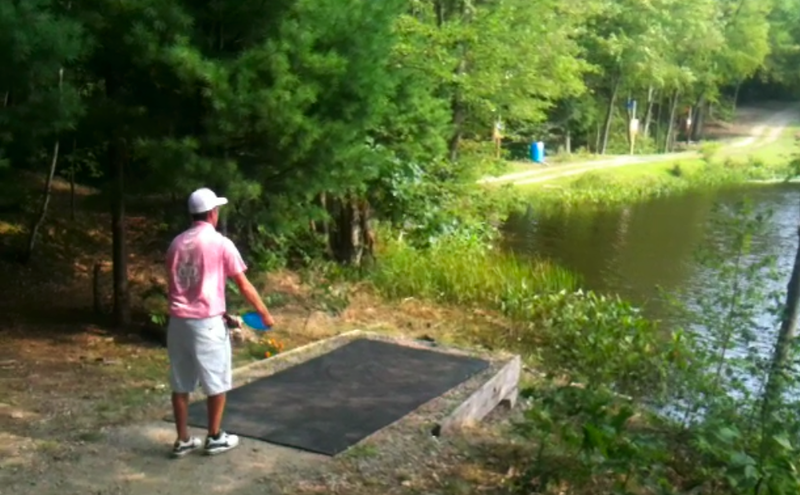 This entry was posted in Touring Pros and tagged 2012, disc, golf, hill, maple, national, open, tour, vibram. Bookmark the permalink.